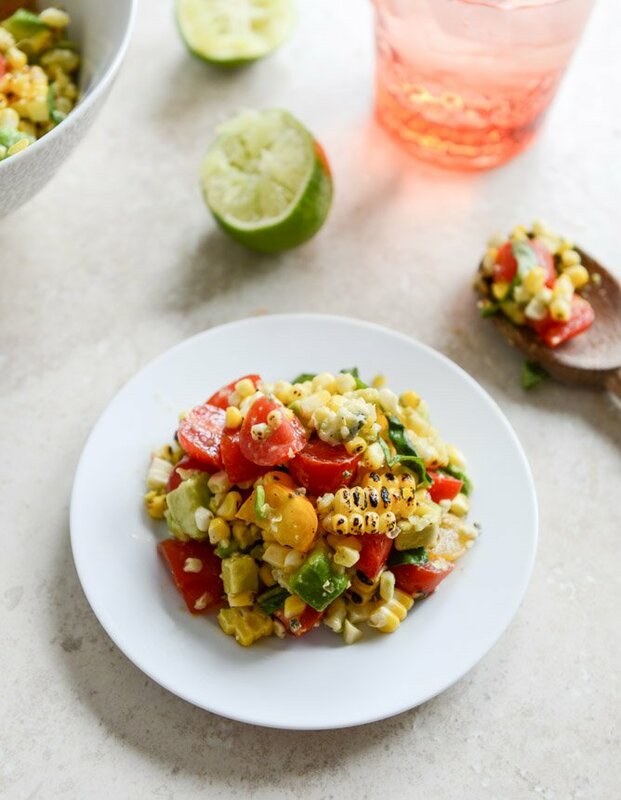 Embarrassingly Easy Grilled Corn Tomato Salad with Blue Cheese and Basil Ribbons. Swear I’ll give you a break on the corn after this. Promise. As the title states, I am a bit mortified to share something so ridiculously simple with you, but we have been eating this nearly every.single.day. for the last few weeks. Actually, when we came back from Nantucket, we DID eat it every day for a week. SOMEBODY had to pick out the avocado but that doesn’t stop me from telling you about it, now does it? Before we get to that, I have to confess that my invisible yet real life is an atrocious mess as I am still living out of my suitcase after arriving home eight days ago. Yes, eight. And the best part is that my suitcase hasn’t even made it to my room yet. Nope. Oh and actually, it’s two suitcases. Both just hanging out, one in the foyer – yes, you’ve got that right – and another one on the living room floor. Shoes everywhere. Clothes in piles. How old am I? It all started because it was way too heavy for me to carry upstairs on my own and since we got home around midnight, I didn’t feel like whining and complaining to my husband to drag it all the way upstairs. So it only made it up one floor. I decided that I would unpack it early the next morning but, um, you see how well that panned out. Last summer I started to make a conscious effort to unpack my crap the minute I arrived home – making it the first thing I did. Otherwise, I would spend four weeks running halfway down the stairs to grab just one thing from a ziplock back full of toiletries. Right. Not grab the entire bag. Not take the whole bag upstairs in the thirty five thousand times I climbed the stairs in one day. Just leave it there. I’m the epitome of the worst thing ever about this generation. And why yes, of course I know that in the four minutes it took me to type all that out? I could’ve dragged that stuff upstairs. Wah. My grandmothers would be horrified. So while I haven’t had time to do chores and unpack, I have had time to read some trashy magazines, eat a s’mores blizzard from dairy queen, attempt some Pinterest-failed nails, watch Pitch Perfect twice and make this salad every other day. Funny how that works. Anyway, enough. 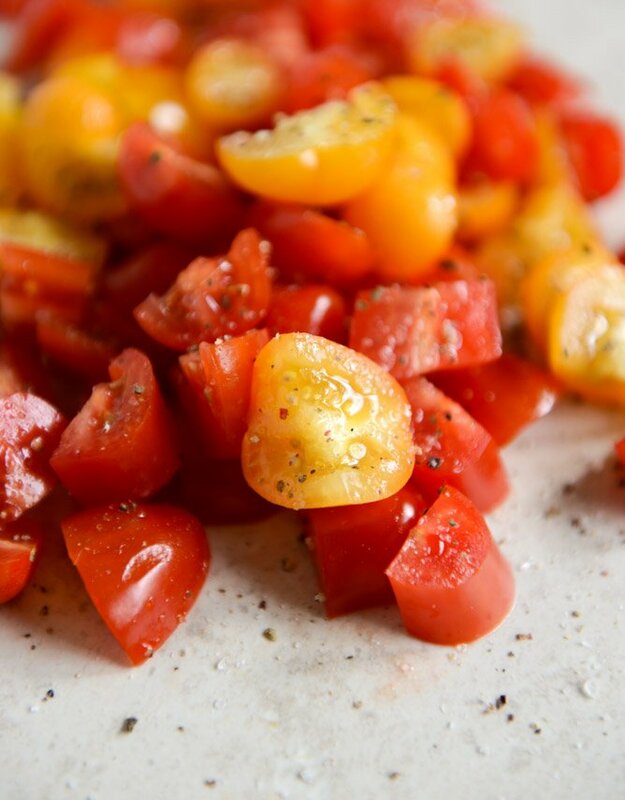 I think by now you know how I feel about corn and tomatoes in the summer – though I must admit that I’m very partial to grape and cherry tomatoes, not big slices unless we’re talking heirlooms. 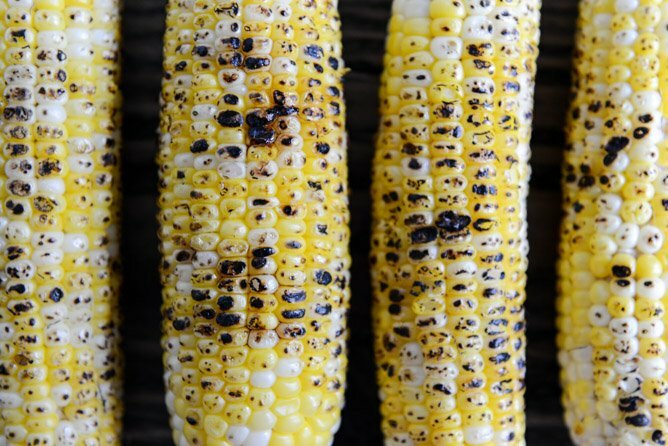 This dish… it’s so versatile. It can be a simple side, thrown in a salad, a pizza topper even. For me, the most important part of this salad is seasoning it with salt and pepper. It just takes it over the top. I know how ridiculous that sounds but it’s an essential step. And while I’ve been on an obnoxious feta kick, I really liked the switch up with blue cheese here. I vividly remember my parents eating slices of tomato with blue cheese and balsamic nearly every summer night at dinner when I was kid. 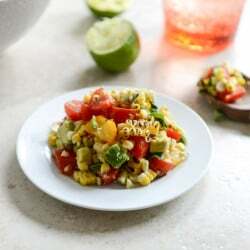 Combine corn, tomatoes, avocado, salt and pepper in a large bowl and toss to coat. Add in the juice of one lime and the olive oil and toss. Top with crumbled blue cheese and basil ribbons and toss once more. Serve immediately. 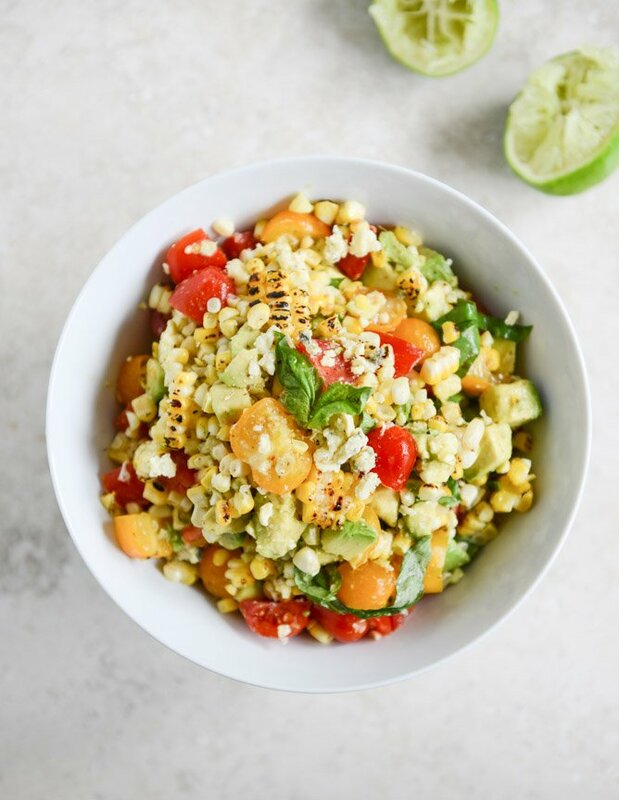 Even with the avocado, this stays good in the fridge for a day or two – just press a piece of plastic wrap tightly against the salt and refrigerate. If you’re my husband, this stays good in the fridge for 4 or 5 days. Oomph. This is also really good with chips! Obviously. OK this looks FAAAAABULOUS! And I love your serving sizes haha! Great post! I made this the other night to go with hamburgers and it was amazing. Tonight I put the leftovers on fish tacos…out of this world!!!! Can you sub a cheese other than Gouda goat, or feta, for the blue cheese ? Not into much cheese except mozzarella, Mexican melting cheese, and Velveeta! !